[Paulo]’s got a few solar panels on his shed, and while he does have a fairly nice setup with a battery charge controller, he found himself looking around for a panel voltmeter. Of course you can buy a panel voltmeter for under $20, but [Paulo] wanted something that fit his 4-4-4 plan; his voltmeter should cost under $4, draw less than 4mA, and last for 4 years. The jury is still out on the 4 year qualifier, but he did manage to meet his other goals by repurposing a dollar store pedometer as a voltmeter. The pedometer in question is a very simple device. After inspecting the PCB, [Paulo] found it operates by looking at a trigger pin and incrementing the number on the display each time the circuit closed. [Paul] designed a very small PIC12F-powered circuit that reads the voltage of his batteries and triggers the pedometer’s LCD for every 10th of a volt. To display 12.6 Volts, [Paulo]’s code triggers the LCD 126 times, for example. After wiring up the reset button so the display will go back down to zero for each new reading, [Paulo] encased his new volt meter in a plastic box. It’s not exactly a fast way of measuring voltage, but seeing as how that won’t change very fast, it’s the perfect solution for [Paulo]’s solar charger setup. I love seeing repurposed stuff like this. $2.00 voltmeters are all over ebay. Worse: IIRC, Harbor Freight has digital multimeters for free with a coupon, just now. Incidentally, I got one for a few dollars a year or so ago to leave on the dashboard, monitoring a simple solar charging rig for my work truck. Works a treat for that, and is cheap enough that I don’t care what happens to it. Stopped here to say just that. Can’t beat Harbor Freight for cheap multimeters. Sometimes I really wish there was a downvote option. This site is called hack a day and you’re complaining when one of the projects on here is actually a hack? I’ve been using these cheap little pedometers as “event” counters for awhile now. This is a neat application that I had not thought of. I Like! If you wait 2+ weeks you can purchase it for $0.99. I was referring to the price of a pedometer, it can be bought for .99 on ebay, just have to wait 2+ weeks. the design is ingenious, but with a bit of struggle you could actually build it from scratch for $4 using a bigger micro and a three digit 7 segment display. Why not use an analog meter? They are easy to get for $4 or less, draw *no* power supply current, and will easily last for years. It easily meets his 4-4-4- rule. All it takes is a scaling resistor in series to set your full-scale voltage, and perhaps a zener diode in series if you want an expanded scale (0-10 on the meter face reads 10-20 volts). Where can you get an analog volt meter for less than $4? 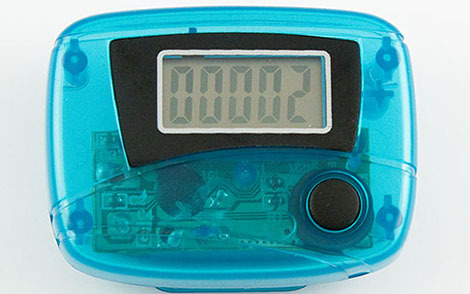 Some pedometers are given as shwag at trade shows, fast food joints, etc. You have to watch out with deals like that. Notice that the meter is good from 3.2 to 30 V. That’s because it only uses two wires, which both supply the power and measure it. Meters like this are really made for only one purpose: indicating the voltage in automotive systems. Now, MAYbe this could be hacked, separating the power from the measurement input, but if the connection is under a blob of epoxy or on the wrong side of the board, this would be a challenge. Wire another pin on the uController to hit the reset every so often to update the readout. Missed that part did ya? I bought one of those a while ago on ebay, $1, free shipping. (xkcd 576) because I was sure there was something I could do with it. I’d like to know more about how you produced the pcb tho, thats not cad, it looks like tape and doughnut? was it phototransfer? i have been wanting to repurpose an old calculator for the lcd. i thought using the keypad buttons would be a lot simpler than figuring out how to talk to it, but probably at the cost of control pins and speed. You can make a calculator increment like this. If you enter 1 + +, then every time you press = the display will increment by one. Not quite as simple as this project though. I didn’t want to report, dammit. Anyway, instead of using ‘+’ you could also use ‘-‘, of course. And instead of ‘1’ you could use any number that suits the task at hand. Like the diameter of the wheel you applied a magnet to. You could also start at, say, 600 and decrement. Connect a reed contact in parallel to the ‘=’ key of the calculator and you have added a very useful feature to the device. I use mine for counting the number of windings when making pickup coils. Yeah, you can do all that. Machinists do that sort of thing to count coil winders, wire used etc. The point was it’s harder to set up via a microcontroller; it requires multiple outputs to do a reset and so on. I wonder if you can use a pedometer to get a quality of the road measurement, count the bumps while biking, or even driving a car for potholes, and make an average for every route. But wait a sec, you can use the accelerometer of phones when they are in cars too I guess to get the measurement. But either way, it’s a new data set to publish and overlay on maps. And for areas with lots of speedbumps for instance it pays for drivers to know this, plus there are people who get carsick on roads that are too bumpy. Just a quick note to everyone thinking of using one of these Pedometers, they are limited to the number of counts per second they can register. HOWEVER, you can get round this to some extent, there is usually a resistor on the board which controls the internal clock of the pedometer, reducing the value of this resistor (usually something like 470K, reduce this to 100k) will increase the clock speed and increase the number of counts per second available. The resistor is probably the one hidden under the white wire in the picture on the site. I used one of these for a Geiger Counter some time ago, it wasn’t fast enough so I did this. Don’t use too low of a resistor though, it also controls the LCD scan, if this goes too fast then the digits get all messed up. I wonder why he used extra transistors to control the inputs. Switch the GPIO’s between input and low and you have the perfect open drain output. But some years ago I got a whole multimeter for around €4,- . I had one with this small 12V battery, but it was dead. While trying to buy a replacement in a veray big department store I noticed, that it was more expensive than the new DMM (with 9V battery included).